Apologies, no marathon update for two days despite my best intentions and, at one point, endeavour. I’ve just been soooooooo busy! But an email from a friend demanding an update has spurred me into action this morning. Truth be told I got a little sunburnt yesterday so I’m staying under cover this morning at least. I hope you enjoy this update plus picture gallery at the end. I do have an ulterior motive though. Monday saw me taking a drive up to the north of the island to the parish of St Lucy. 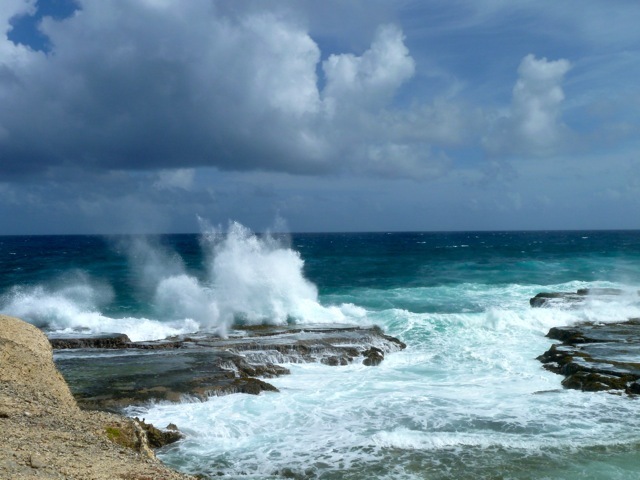 Once you get north of Speightstown the landscape gets increasingly flat and windswept as the north point of the island nears. Trade winds from the east mean a fairly constant stiff (but warm) breeze that results in the verdant greenery being ever on the move. The useful ‘Barbados in a Nutshell’ map (which seems to be the only road map for the island) indicates where beaches can be accessed on foot or by car, and I had decided to head for Archers Bay. It was certainly out on a limb. The further north I got the more I thought how much the windswept landscape resembled the scattered crofting communities of the Western Isles in Scotland. The similarities end there though. Barbados is entirely coral not Lewisian Gneiss and there isn’t a peat bog to be seen! Archers Bay beach turned out to be inaccessible, or at least I was unable to find the access path down the razor sharp coral cliff to a small beach. 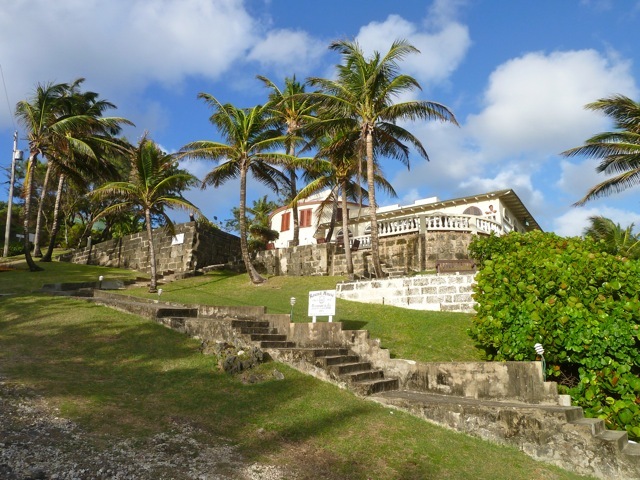 The access road was rather interesting though – I drove for about a quarter of a mile through a coconut grove, negotiating sticky up lumps of coral that could have ripped the tyres to shreds at a moment, and I had to negotiate a flock of Barbadian sheep too. 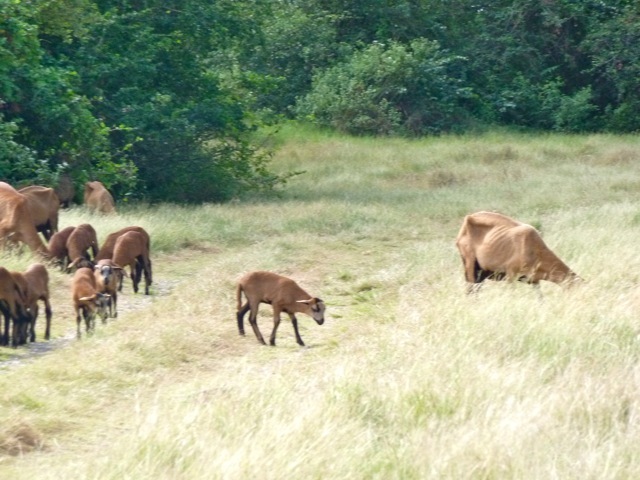 The Barbadian Blackbelly more closely resembles goats and breed all year round unlike most domestic sheep. Because they are larger and faster growing than most wooled sheep, they are a good choice for commercial production. There is a strong market locally for their lean and mild-flavored meat. They are ‘hair’ sheep which means that they do not grow wool and are therefore able to tolerate the tropical heat. From Archers Bay I then headed east to Little Bay. I loved Little Bay. Correction, I love Little Bay. 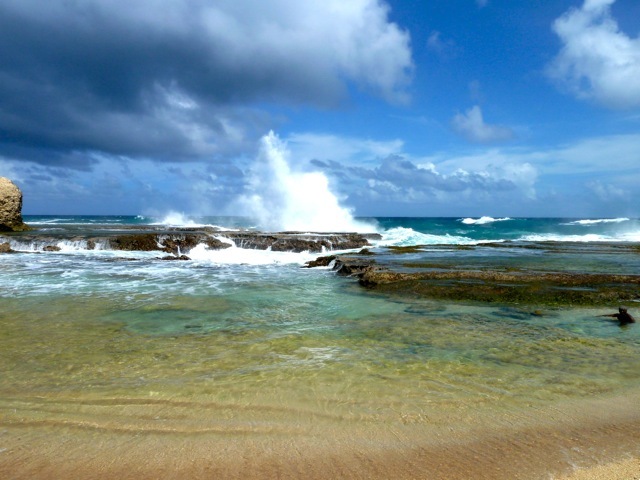 The passing of time has eroded the east coast of Barbados, pounded as it is by the Atlantic Ocean (next stop The Gambia, 3000 miles east). 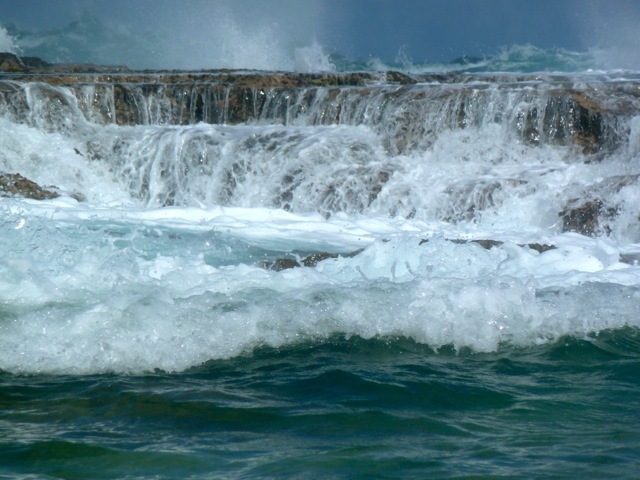 The coral breaks down or simply washes away, leaving amazing rock formations and blowholes which the violent seas crash through very dramatically. Little Bay is one such place. As its name suggests the bay itself is very little when the tide is in but there is considerable evidence that it would have been much bigger many moons ago. An easy walk down the eroded cliff on a easy gradient path leads you to a small semi-circular bay beyond which are two raised coral platforms with a channel between. Beyond the platforms the Atlantic Ocean crashes in with huge turquoise waves and flying spray. It is quite a sight – see pictures. Whilst I was snapping away with my camera – shock, horror – someone else appeared on the beach and entered the water. He sat down in a natural bowl, another effect of the sea erosion. 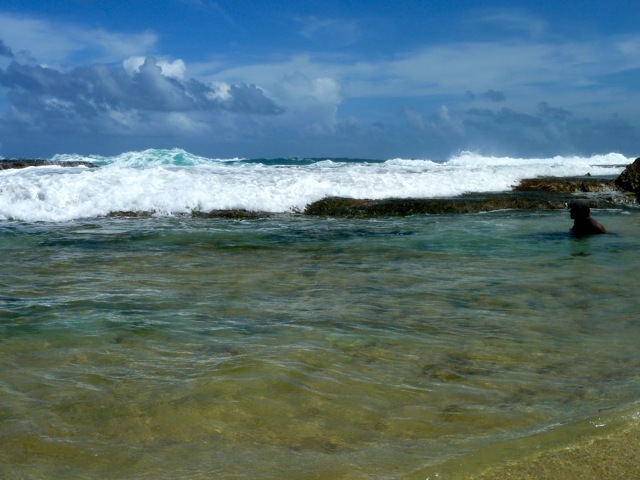 From my vantage point I could see the crashing waves, which would often break over the coral platforms and suddenly whoosh into the little bay where my companion had sat himself down in the water. But as I later discovered when I joined him, when you’re sitting there you have no idea what’s happening up on that platform and therefore when or how big the next wave will be. It’s great fun! 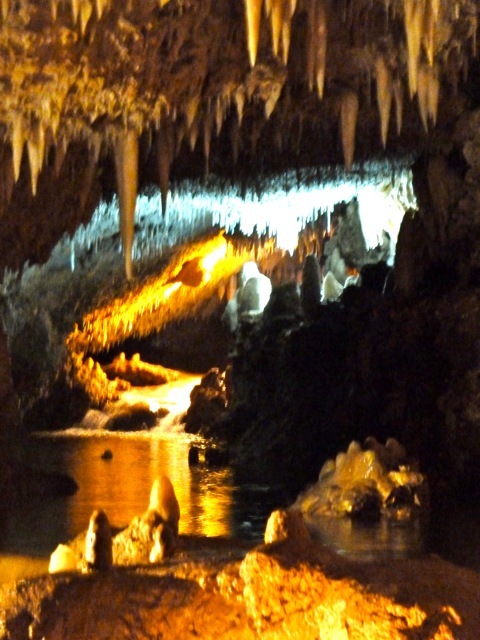 Another place I’ve visited, on recommendation, is Harrison’s Cave. The site has, apparently, undergone a massive transformation in the past four years with the development of lifts and an electric tramway. When I think ‘tramway’ I imagine trams running on rails. Well this is different – the tram is actually a glorified, articulated, golf buggy seating about thirty people. After watching the obligatory introductory film which described how Barbados was created 60,000 years ago (apparently) by the collision of the Atlantic plate and the Caribbean plate, I boarded the aforementioned tram for a journey one mile underground. It was, actually, very good, and I’m pleased that I went. But I was annoyed that the tram didn’t stop in various places on the route where the caves were beautifully lit with coloured lights, for example a cascade running down the side of the tramway would have made a beautiful photograph. Here I must acknowledge with ever greatful thanks, my wonderful 50th birthday present from The Sainted Marion. My sooper dooper camera has a night portrait setting which enabled me to take some great pictures in between the camera flashes of the other tram passengers. 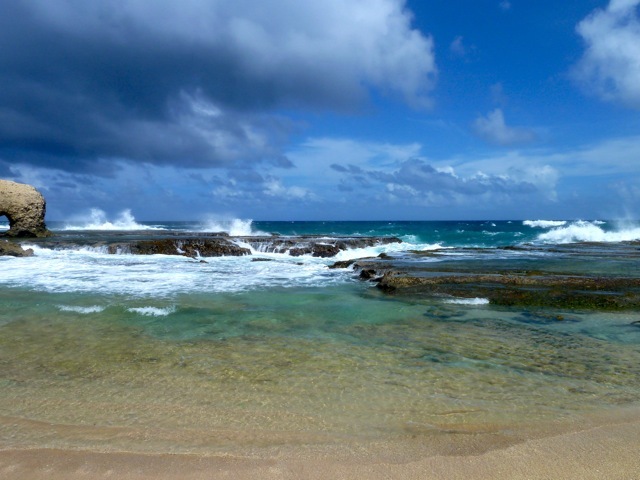 Good to my word, at the recommendation of Kyle Boyce, I have visited Foul Bay in the south of Barbados. As Kyle said, its right next door to the famous Crane Beach yet it is totally deserted. Shortly before I pulled up at the parking place the local radio station had broadcast a surge warning for the eastern Caribbean, warning all folk not to attempt to swim in the sea as the waves would be higher than usual and a strong current to boot. Well the waves they were certainly a crashing! Heeding the advice I decided against an immersion so I didn’t change into my bathing shorts. 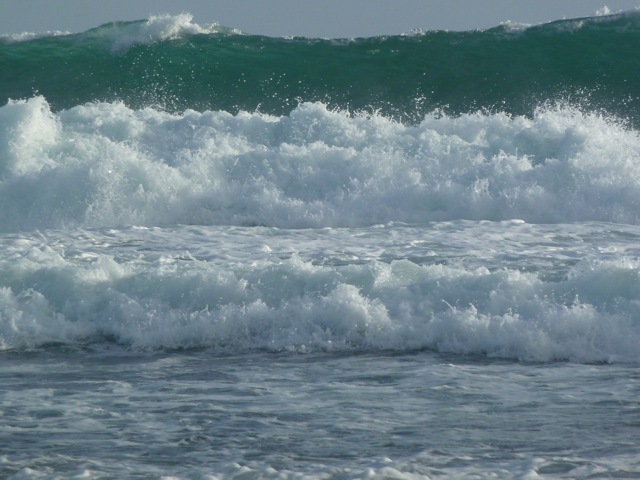 Consequently when I went for a paddle (without camera I hasn’t to add), a larger than anticipated breaker soaked me from head to toe, covering me in fine sand in the process! It was rather a damp journey home after that … I mistakenly thought that I’d dry out nicely as I drove along (sitting on a large towel I hasten to add), silly me. I was certainly able to comprehend how the bay got its somewhat unusual name. The running sea was indeed foul, and I suspect its like it was on my visit most of the time, even when there isn’t a surge warning in force. This morning I was up with the lark and driving across the island at 6am in the hope of catching the sunrise on the east coast. Unfortunately it broke the horizon when I was halfway over so that came to nowt. 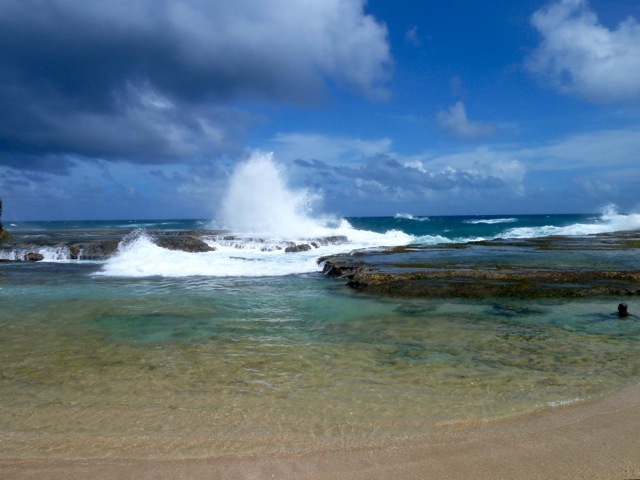 However I made up for the bad timing with a return visit to Bathsheba where I had the beach entirely to myself at 7am and for a goodly while after that. 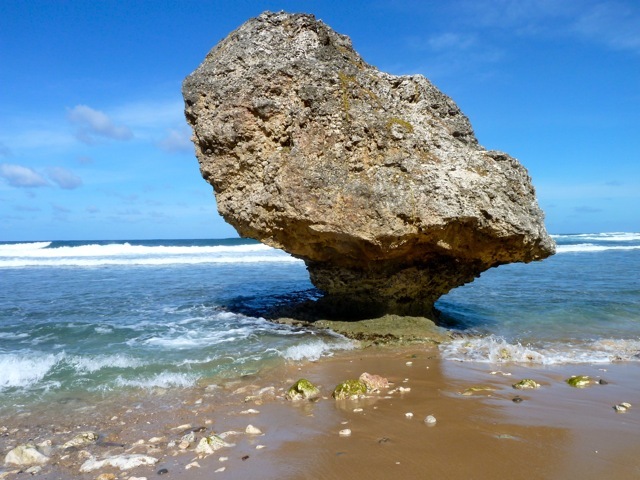 There are certainly better beaches in Barbados than Bathsheba, there can be no doubt about that. 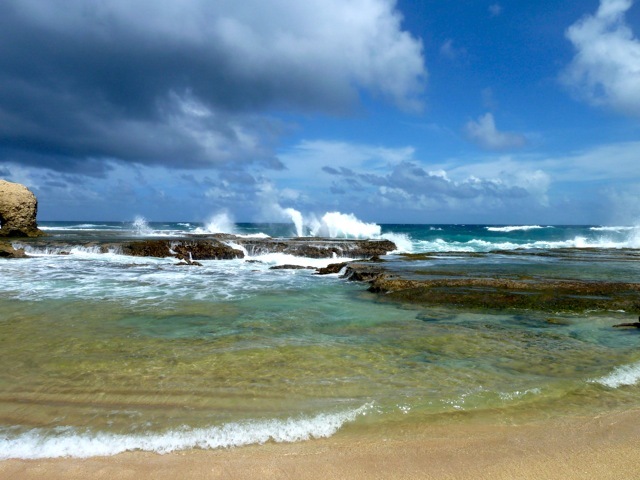 But there is is something rather special about the gargantuan lumps of coral rock in the surf and the shoreline punctuated with wildly waving palm trees. And I think that’s about all for now. More jottings to come, but now its time for another swim, but in the pool staying well out of the sun for the time being!